What is it about beautiful objects that is so compelling? Often, when I have some time to wander the galleries of the Metropolitan Museum of Art, I find myself looking at things, at artifacts and ancient sculpture; I visit old friends and discover new ones. I don't quite know why these often take precedence over spending time in the painting galleries; perhaps it's the satisfaction of seeing three dimensional things I can imagine running my hands over; perhaps it's their mystery. 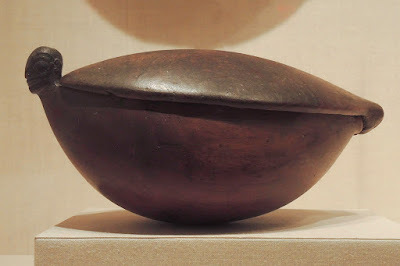 On my most recent trip I looked through the galleries of the Arts of Africa, Oceania, and the Americas and saw a few objects of stunning simplicity, where the purity of form spoke very strongly. The shell ring, made from the shell of a giant clam, is a form of wealth for the Abelam, and also a part of ceremonial life. The irregularities of the surface play against the perfection of its curving form. 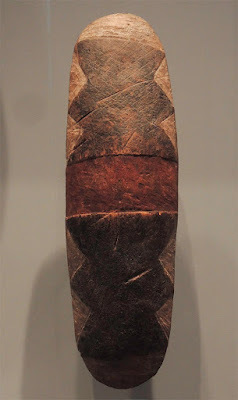 Bannerstones, archaic Illinois and Ohio, 3rd - 2nd millenium B.C.E. These ancient carved stones were used as spear weights. 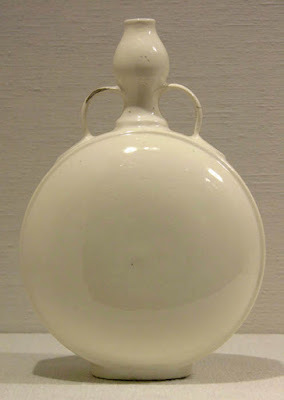 I love seeing very old utilitarian objects that were crafted with exquisite care, each one an aesthetic object. The fact that thousands of years ago different peoples around the world sought beauty touches me deeply. 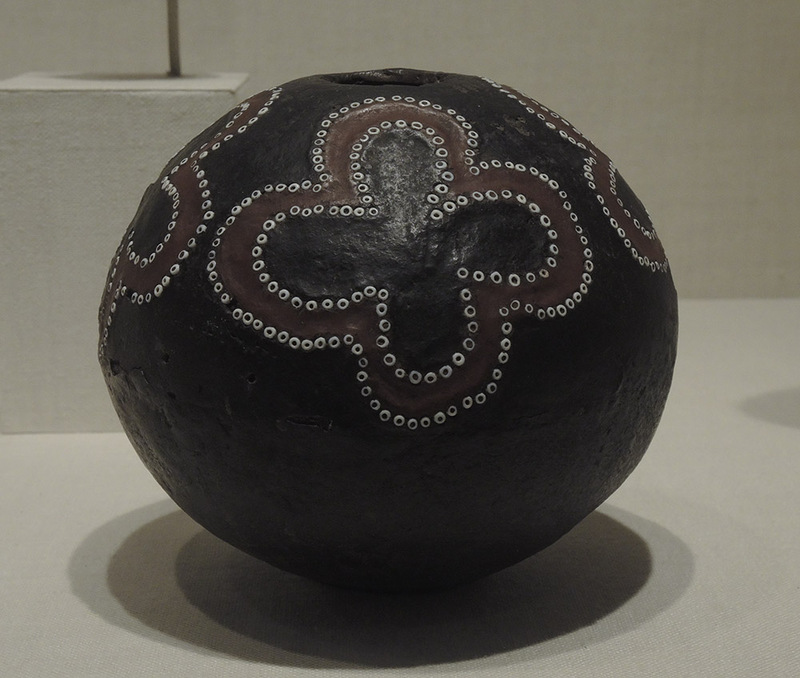 Lidded Bowl, Marquesas Islands, 'Enana peoples, late 18th - early 19th century. The simple shape of this bowl is described as bird-shaped in the Met's wall label. I hadn't recognized that, but I did respond to its graceful curves, which end in a stylized human head. I'm not sure what this object is because I photographed the incorrect wall label; I'd thought it was a fishing float from the Solomon Islands. But whatever it is, the dark irregular sphere and its elegant decoration are wondrous. 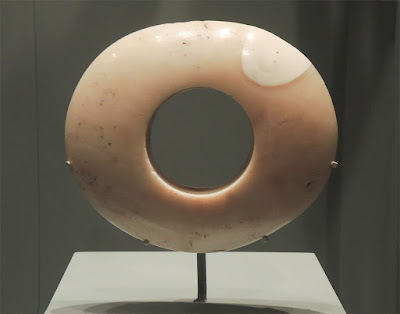 I love both the extended oval form of this shield and its geometric decoration that pushes against the curved edges. The central horizontal band of red creates a break in the rhythm, a sophisticated syncopation. 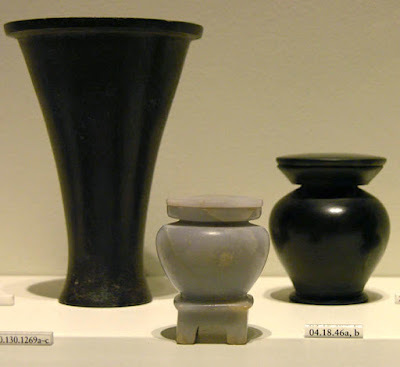 The Egyptian jars and the two porcelain works below are objects that I photographed on previous visits to the Met, but which fit in with the theme of clear and simple form, form which I find so pleasurable. I look at Egyptian works often, especially Egyptian reliefs, which inspired me to begin my series of relief sculpture. On the Met's second floor, in cases to the left of the grand staircase, are many elegant Chinese porcelains, beautiful in color and in shape. I love these pieces, not the highly decorated vases, but the ones that are mainly a single color––white or yellow, or oxblood–––on a pure form. 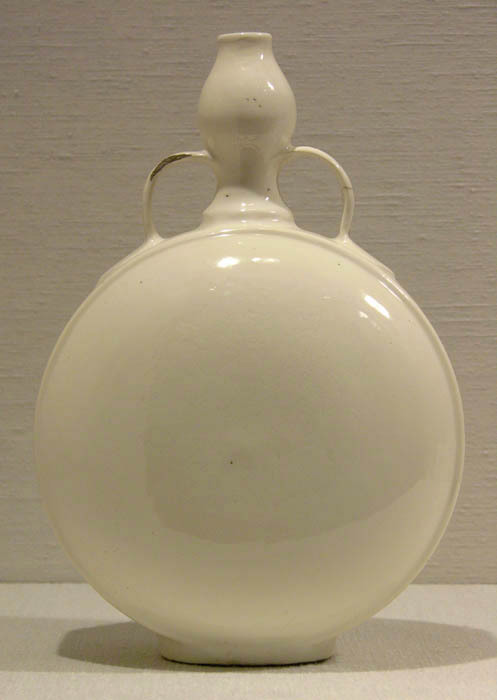 Moon Jar, Korea, second half 18th century; porcelain, 15 1/4 x 13 in. 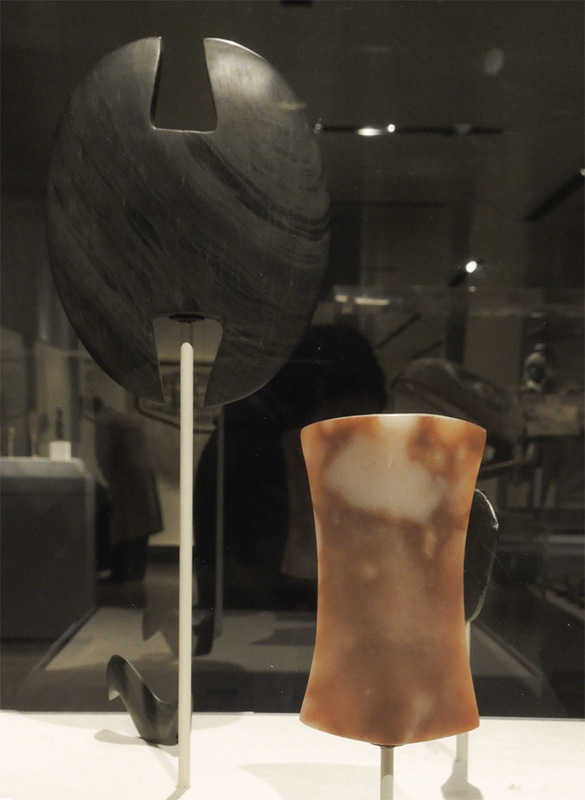 There is a gallery dedicated to Korean art in the Asian wing at the Met, with intriguing objects on view, especially ceramics. 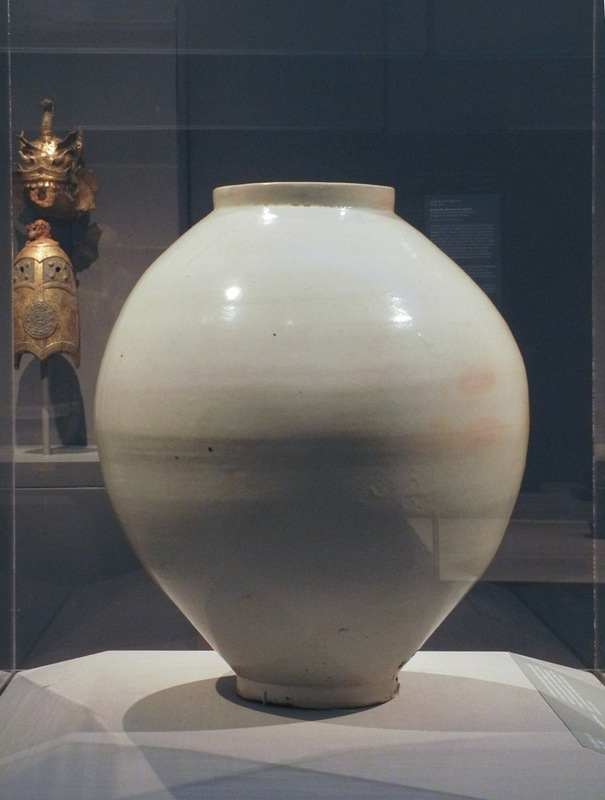 The Moon Jar with its gently swelling form and delicate coloration is a favorite of mine. 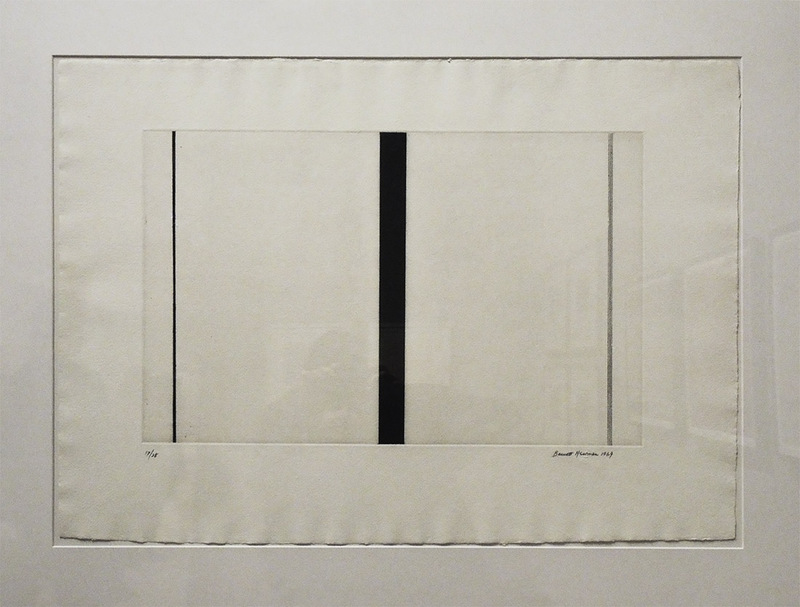 Barnett Newman, Untitled Etching #1, 1969; etching and aquatint, 23 3/8 x 14 11/16 in. 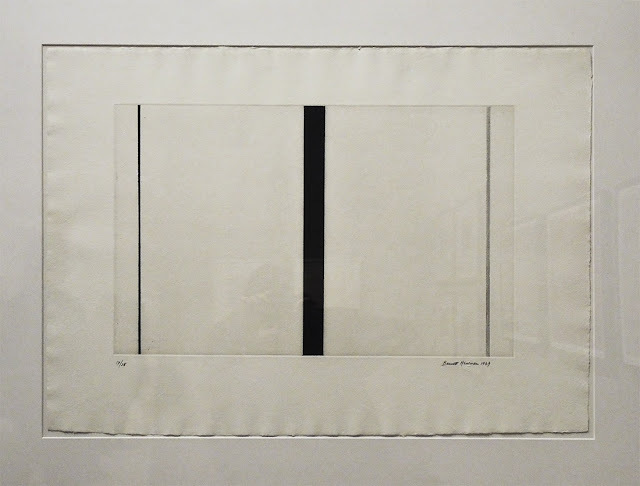 After admiring the objects from the Americas and Oceania, I felt that the pure, simple form of this Barnett Newman etching had an increased resonance and weight. It's not only a modernist abstraction, but it is also an heir to a millennial-old tradition of art's fundamental aspect, pointing to a quality of transcendence. The clearing away of extraneous detail and of narrative, the focus on the essential, gives to all these works a sense of the extraordinary, the magical, and shows the power of art to elevate and enlarge us.